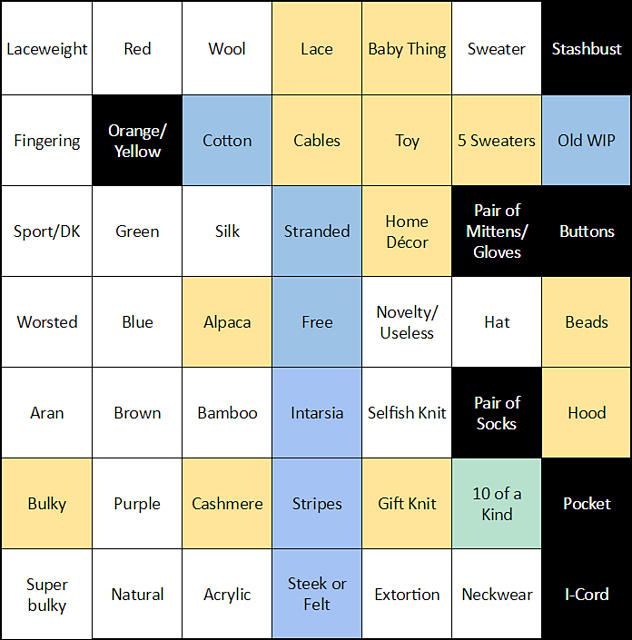 Over the course of the last couple of years, I’ve participated on and off in Reddit Knitting’s KALs. A KAL is a knitalong – where you all knit the same thing. It’s great for learning new techniques, as you have a large group of people you know available to answer questions. Last year there were a lot of people (myself included) who were participating in the spirit of the event, but for some reason or another, not doing the selected pattern. These were deemed “OtterProjects” due to the fact that I can’t read. There were eventually more people doing OtterProjects than the official KAL pattern and things derailed a bit. So for 2017, two moderators of our Ravelry board decided to put together a year-long Otter-KAL. It’s like a bingo board, but with 7 columns. I’m proud to be the one to re-name it to BINGOMG. There are approximately a half a billion rules, but the general idea is every two months they’re going to hold a drawing for people who have completed a BINGOMG (7 finished squares). At the end of the year there is a super special prize for anyone who manages a blackout. This is my ultimate goal, of course. My BINGOMG project page is here. I plan on updating it periodically, but right now it’s my main link to the Excel files I am using for planning/progress keeping. 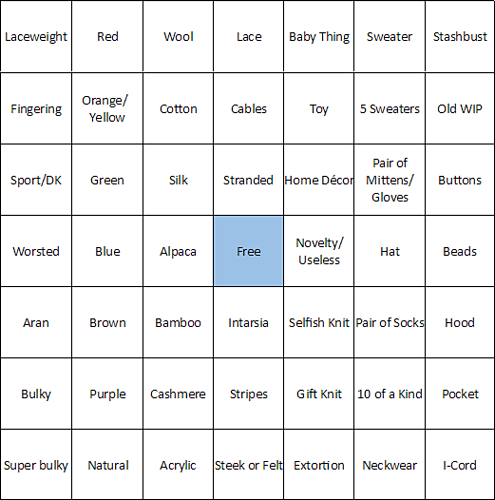 I actually have a couple of projects that aren’t listed on the board yet because there are too many squares that they could count for. So we’ll see where they go in the next submission window (March, iirc). I’ve got time. Which is good, since there are 6 sweaters on there. Good thing I have far too many sweaters queueueueued.